Although considered more of a junk food than not, my version of chilli beef tacos has more fresh vegetables in a single serve than your regular sandwich. Firstly, I add canned tomatoes and corn, onion and a 4 bean mix to my chilli beef – it helps bulk it up and makes it nice and colourful as well. For the toppings we use a mix of tomato and capsicum, avocado and, of course, grated cheddar cheese. Fresh green leaves such as finely chopped lettuce, baby spinach or beet leaves are also a must. Lastly, pot set natural yoghurt with some sweet chilli sauce acts as the salsa – you can’t even tell the difference between that and sour cream! Low / no fat yoghurt contains 0 – 2% fat compared to sour cream and cream cheese which are 20-40% fat. So when it comes to tacos in this household, there is only one rule: all toppings are mandatory. There may be a few ingredients listed below, but the chilli beef mix is extremely easy to make. You can use the same mix and toppings for nachos, burritos or enchiladas. To make the chilli beef tacos: heat oil in a large stock pot and brown onion lightly. Add beef and cook, breaking up with a wooden spoon, until mostly browned. Add the entire contents, including the juices, of canned tomatoes, beans and corn. Sprinkle over a sachet of taco seasoning mix and stir through to comibine. Cook for about 10 minutes or until the chilli beef has thickened a little. 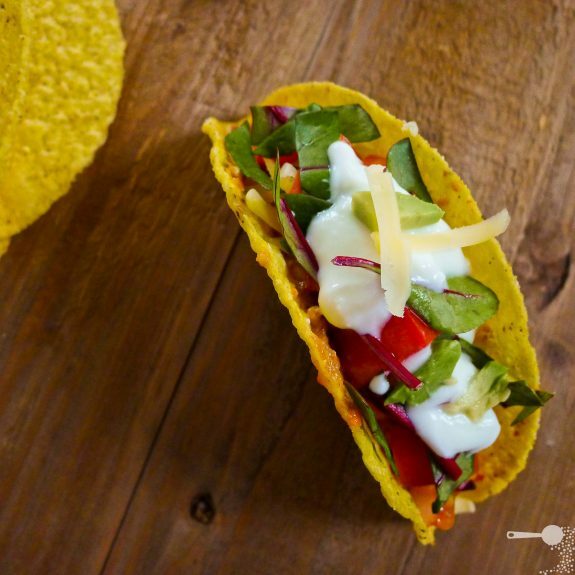 Prepare tacos according to packet instructions – generally warm up in a hot oven. To serve: place all toppings on a large platter for everyone to help themselves. Serve chilli beef and tacos alongside. We just had tacos and margaritas tonight and now I want to go have another. Great recipe. Great! I make them quite healthy as well – I just wish the other half liked beans, I LOVE them and they would go really well 🙁 Oh well, the things we give up for love, lol! Your photos are divine! The kids are nit great fans of beans and were really surprised when u told them there were beans in. Maybe you could try mashing them up a little and adding in? That looks soo good and healthy! I did a post on tacos this week, please check it out and let me know what you think: http://shecooksandheeats.wordpress.com/2011/07/26/mondays-are-manic-wednesdays-i-hump-thursdays-i-dont-care-fridays-i-love-but-tuesdays-are-all-about-tacos/. Thanks for sharing! Oh oh oh ohhhhhhh I love tacos. We’ve been doing soft shell prawn tacos lately, using corn mountain bread (only 70 calories a piece!) and we make a spice mix instead of taco seasoning… I’ve been meaning to put it on the blog but we’ve only JUST perfected the recipe. Awesome I just was reading how to grow chillies so now I know how to use them. My two favorite things – easy & tasty!! Healthy is a bonus – thanks for a great recipe! I joined in this week too!!!! =) For the 1st time! I had a blast gntiteg it all ready!!! Plus I knew what I actually needed when I went to the grocery store!!! =)I’m saving time in the kitchen and we are saving money in the store!!! This way I’m not buying things and letting them go bad!!! !